To learn more about what the Nicaragua Covenant is doing today, or to inquire about joining a mission team visit our website: www.nicaraguacovenant.org or find us on Facebook (search for Quinta Amanecer Nicaragua). From a 1986 mission of peace led by a few bold New England United Methodists to war wracked Nicaragua until today, the Nicaragua Covenant has served to carry out the healing ministry of our Lord Jesus Christ in covenant with the people of Nicaragua. After three decades of supporting mission programs the Nicaragua Covenant (NC) remains centered on healing the sick, feeding the hungry, and clothing the naked. 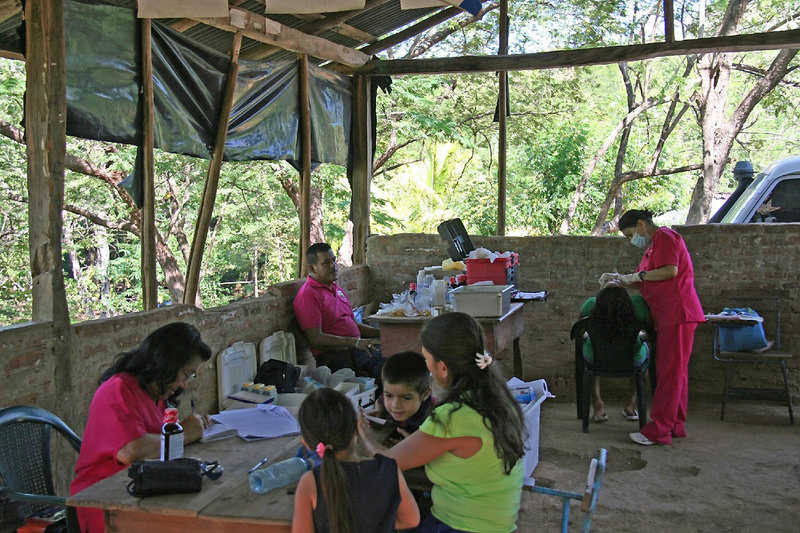 Today the Nicaragua Covenant’s Amanecer Mobile Health Clinic (AMHC) now serves more than 30,000 of Nicaragua’s poor providing health and dental care in 30 different remote locations on a set schedule. The impact has been life-saving for hundreds of individuals. The cost of free healthcare for one individual served by the AMHC is $4 per year. The scientific data-driven pairing of clean water and sanitation projects to address waterborne illnesses in served communities has proven to be a critical third variable to many of these communities. The results showed an average 76 percent decline in the incidence of preventable illnesses because of access to basic community healthcare, clean water, and sanitary waste systems. The impact on the quality of life for thousands of Nicaraguans has been significant.The average cost of providing a source of safe water and latrines for a community is $18,000. In cooperation with partner organizations, the NC continues to support feeding, education, and sewing programs to provide better opportunities for the poorest of the poor in Nicaragua. NC feeding programs provide more than 70,000 meals a year to children and the elderly in six impoverished communities. By working with partner organizations, the Nicaragua Covenant is able to feed thousands of hungry children for $4 per child, per year. Additionally, the NC provided stipends for teachers serving elementary education needs for hundreds of children in eight rural communities. The legacy NC sewing programs continue to evolve to meet the needs of women (and some men) that are seeking a way to improve their economic opportunities.These enabling and empowering programs can be sustained for less than $8,000 per year. Please join us in supporting these vital mission programs through your voluntary service, donations, or prayer. The Nicaragua Covenant continues to lead several Volunteer in Mission (VIM) teams each year on short term mission trips. VIM teams perform work projects, interact with Nicaraguan communities, and learn about the culture and history of our Central American neighbor. Donations can be made through our website (www.nicaraguacovenant.org) or through the NEUMC, PO Box 249, Lawrence, MA 01842-0449. Please specify Nicaragua Fund #803 in the memo line of the check.